Listening to great original music by a wide variety of artists is, of course, what Appleton’s Mile of Music is all about. But the opportunity to personally engage in music, a unique feature of the four-day festival, aah, that’s what red lines Leila Ramagopal Pertl’s excitement meter. As the music education curator for the Mile of Music, Ramagopal Pertl will oversee a 28-person team of music educators, most with Lawrence ties, that will conduct 40 hands-on music-focused workshops during the festival, which runs Aug. 2-5. This year’s festival — Mile 6— will feature 900 live performances by 208 artists/bands from 29 states as well as Washington, D.C., and Canada at 70 venues along College Avenue and the Fox River. The interactive, education workshops designed for both the young and the young at heart range from Balinese gamelan and Ghanaian drumming and dance to didjeridu and ukulele. who has led the music education team since the festival’s inception along with her husband, Brian Pertl, dean of the Lawrence conservatory. 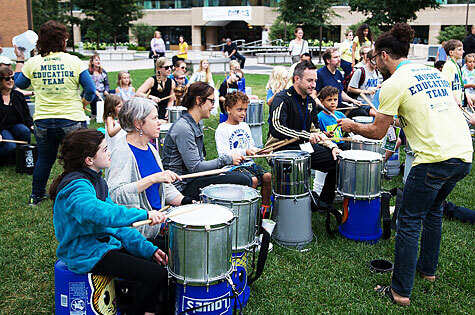 Lessons in Ghanaian drumming attracts musicians of all ages during the Mile of Music education workshops. At last year’s festival, the music education team engaged 5,000 participants in the workshops. Ramagopal Pertl hopes to increase that number by at least 500 this year. New for Mile 6 will be a reinvention of a festival staple, the Great Mile of Music Sing-a-Long. This year’s sing-a-long will celebrate rich music diversity with culture leaders from all corners of the Fox Cities teaching songs from their traditions, including Oneida, Congalese and Latino cultures. José Encarnación, director of jazz studies at Lawrence and one of the country’s top jazz saxophonists, will trade his instrument for his dancing shoes. 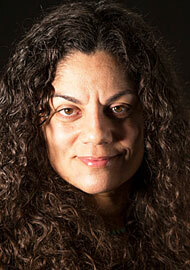 He and his wife, Marisol, will showcase their superb salsa dancing skills in a pair of workshops. 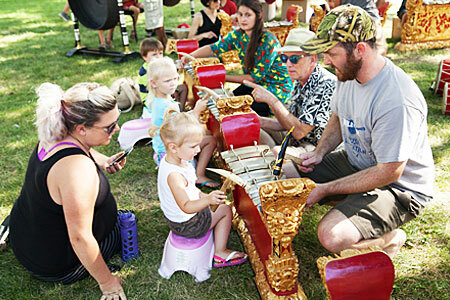 The Balinese gamelan is always one of the favorites among the Mile of Music education workshops. Another performer/education team member are the members of Porky’s Groove Machine, a seven-member band of all Lawrence graduates who call themselves “(unofficially) licensed providers of environmentally sustainable nerd-funk.” In addition to seven (7!!) performances during the festival, Porky’s will help groovers of all ages get their funk on in a pair of workshops. “Being Lawrentians, the members of the band are not only top-notch performers, they are also first-rate music educators,” said Ramagopal Pertl.